Although acute toxicity studies in animals are an indispensable prerequisite for the ­realisation of clinical trials in humans, these can only be projected to humans to a limited extent, and thus are scientifically problematic and ethically questionable. Therefore, the international regulatory authorities increasingly recommend the use of alternative in vitro methods in the framework of safety studies in accordance with the ”3R Principle“ (Replacement, Reduction, Refinement). These methods do not replace the required toxicity studies but they do, however, lead to a reduction in animal experiments as well as to savings in cost and time. Within its portfolio of services, Pharmacelsus GmbH offers its customers an in vitro test system for the estimation of acute toxicity of unknown substances. This method, recommended by the US National Institute of Health (NIH), can not only reduce costly animal experiments, but also shorten the time leading up to the studies in humans. Further to this, the medicinal chemists can be informed early enough about the anticipated substance requirement, thereby sparing expensive and time-consuming post-syntheses. Fig. 1 Use of the extrapolation method offered by Pharmacelsus helps to reduce animal experiments. 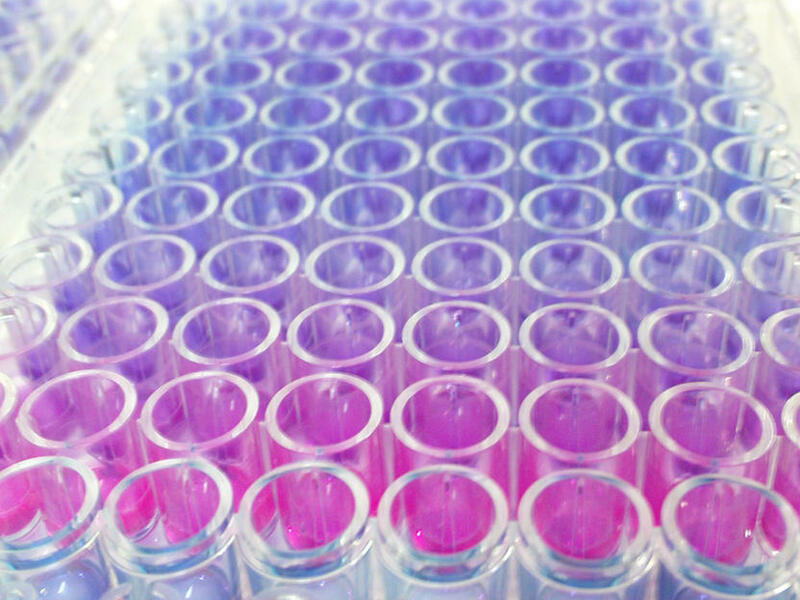 Cultivated 3T3-mouse fibroblast cells in 96-well microtiter plates were used for the experiment. Left picture: Cell culture flasks, in which the cells are cultured in vitro. 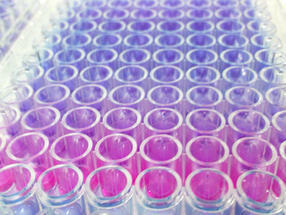 Right picture: A 96-well microtiter plate is filled with medium. Before a new active ingredient can be tested in clinical trials, its safety must be demonstrated. This proof is produced by toxicity tests in animals and is stipulated as compulsory by the regulatory authorities. The purpose of these studies is to determine a dosage that is safe for humans, with which one can start clinical trials. These toxicological studies must be performed using two different animal species (usually rats and dogs) according to the rules of Good Laboratory Practice (GLP). Although only a small part of human toxicity is predictable using such animal experiments, the authorities will generally not grant approval for clinical testing in humans without these studies. Fig. 2 The non-fluorescent dye resazurin is converted in metabolically active cells to the fluorescent resorufin. The number of living cells or vitality of the cells can be determined from the measured fluorescent signal. 347 chemicals, a regression model was developed for estimating the median lethal dose (LD50; i.e. the dose that is lethal in 50 % of the tested animals), (Halle and Spielmann, 1992; Halle, 1998). This can be used for defining the starting dose for the following in vivo toxicity studies, such as the Up and Down Procedure (UDP method) or the Acute Toxic Class Method (ATC). In this manner, the number of necessary animal experiments can be reduced by up to 30 %. Meanwhile, because of these advantages, the method has become generally recognised and is recommended by various international authorities, including the Interagency Center for the Evaluation of Alternative Toxicology Methods (NICEATM), the National Institute of Environmental Health Sciences (NIEHS) and the US Environmental Protection Agency (EPA). The US National Institute of Health (NIH) has issued a corresponding guideline (Guidance Document on Using In Vitro Data to Estimate In Vivo Starting Doses for Acute Toxicity, NIH Publication 01-4500). In this article, the procedure of the in vitro cytotoxicity test and the calculation of the in vivo LD50 are described. In accordance with the NIH Guideline, Pharmacelsus GmbH has integrated the described method into its portfolio and offers it as a service for estimating the in vivo LD50 to customers from the pharmaceutical industry. Using this method contributes to saving of animal experiments and therefore follows the so-called 3R concept (Replacement, Reduction, Refinement) for the prevention or reduction of the use of experimental animals. Furthermore, the development process of new drugs can be accelerated and costs saved. For the qualification and implementation of the test system, Pharmacelsus uses the mouse fibroblast cell line 3T3 (clone A31). Selected reference substances are incubated with 3T3 cells and their toxic effects are determined (Fig. 1). The resazurin assay is used for the determination of metabolic activity, during which the non-fluorescent dye resazurin is converted into fluorescent resorufin in vital cells (Fig. 2). 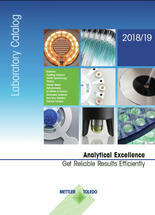 Alternatively, the energy content (ATP) of the cells can be investigated using the ATPLite assay. From the dose-effect relationship of the reference substances, the corresponding IC50-values (i.e. the concentration of a substance, at which the cell viability is reduced by 50 %) are calculated and plotted against the empirically determined LD50 values. 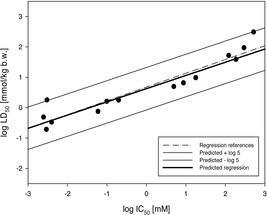 The resulting regression curve serves as the basis for the calculation of the in vivo LD50 of the test substance. The results can be used to determine the starting dose for the UDP method or the Acute Toxic Class method, and thereby considerably limit the necessary dose steps. 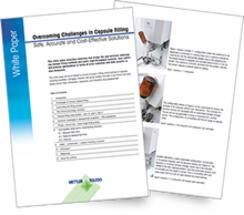 A corresponding test series was performed successfully with a partner from the pharmaceutical industry, and was presented in 2010 during the annual conference of the Society of Toxicology in the USA. Fig. 3 Example of the Pharmacelsus/NIH test method using reference substances. 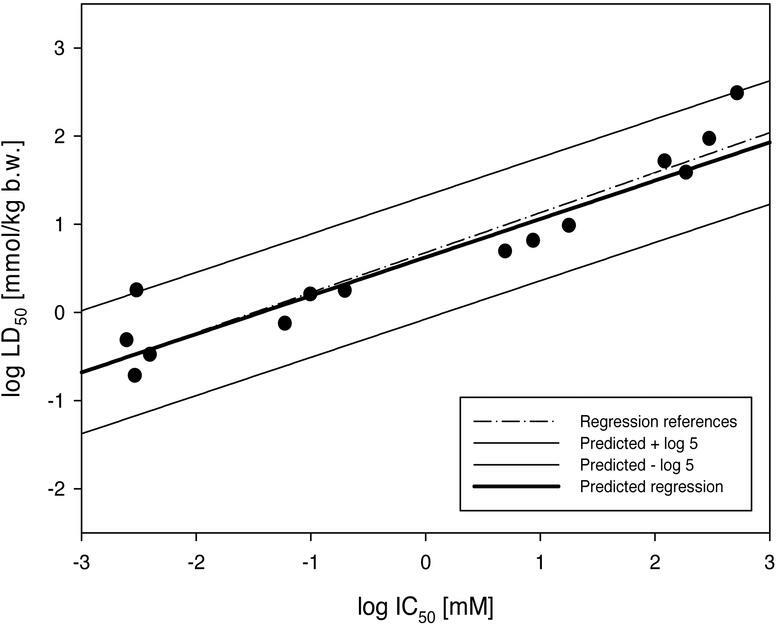 Figure 3 shows the regression curve resulting from the use of reference substances (dotted line) compared with the NIH references (thick solid line). The acceptance limits given by the NIH are represented by the thin black line. The LD50 values calculated by Pharmacelsus show very good correlation with the real LD50 values. First publication: Frühwald, J., Claß, R., q&more, 1.2012.